Author(s): Eleanor Chen. Department of Pathology, University of Washington, Seattle, Washington, WA 98195, USA. Rhabdomyosarcoma (RMS) is the most common soft tissue malignancy in the pediatric population and recapitulates many of the phenotypic and biological features of embryonic skeletal muscle. RMS is pathologically characterized by myogenic differentiation arrest. Dysregulation of pathways essential for myogenesis like contribute to the tumorigenesis of RMS. The Wnt signaling pathway is one of the major pathways required for normal myogenesis. Aberrant Wnt signaling has also been demonstrated in many types of cancer. The role of Wnt pathway in the pathogenesis of RMS is beginning to be appreciated. This review will go over current knowledge on biological roles of Wnt pathway in RMS and potential translational application in therapeutics. Keywords: Wnt, rhabdomyosarcoma, cancer, myogenesis. Affiliation:Department of Pathology, University of Washington, Seattle, Washington, WA 98195, USA. Abstract:Rhabdomyosarcoma (RMS) is the most common soft tissue malignancy in the pediatric population and recapitulates many of the phenotypic and biological features of embryonic skeletal muscle. RMS is pathologically characterized by myogenic differentiation arrest. Dysregulation of pathways essential for myogenesis like contribute to the tumorigenesis of RMS. The Wnt signaling pathway is one of the major pathways required for normal myogenesis. Aberrant Wnt signaling has also been demonstrated in many types of cancer. 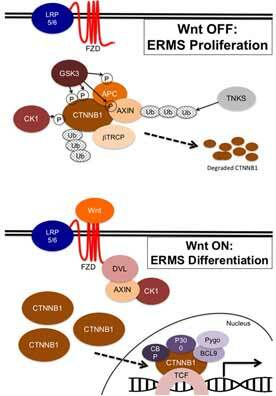 The role of Wnt pathway in the pathogenesis of RMS is beginning to be appreciated. This review will go over current knowledge on biological roles of Wnt pathway in RMS and potential translational application in therapeutics.